Check-in is from 4.00pm and check-out by 10.00am on the day of departure. Where do Lakeside Lodge guests check in? All Lakeside Lodge guests check in at the Killyhevlin Lakeside Hotel main reception, which is adjacent to the Lodges. Yes. Depending on the time of year, the minimum stay is from 2 nights. There is a minimum 2 night stay In Jan-June and November/December. July-August a 7 night minimum stay applies.You can check when booking with our reservations team. No, however, your Lakeside Lodge facilities are fully modernised and include a granite finished cooking station and dining area,integrated dishwasher and fridge/freezer. Dine in the comfort of your open plan lake view lounge leading onto a private furnished decking area, with direct views of Lough Erne. The Killyhevlin Lakeside Hotel offers a choice of 3 dining experiences; choose from fine-dining in Kove Restaurant, casual dining in Lakeside Grill, to relaxing Afternoon Tea, we've got something to suit every taste. Is there anywhere I can dine nearby? Within a short stroll of your Lakeside Lodge, the Killyhevlin Lakeside Hotel offers a choice of 3 dining experiences; choose from fine-dining in Kove Restaurant, casual dining in Lakeside Grill, to relaxing Afternoon Tea, we've got something to suit every taste. To make a reservation simply ask at the time of booking or call reception from your Lodge. Will my Lodge be serviced? An initial supply of bed linen, towels and tea towels are provided for your Lodge on arrival. Lodges are serviced on a weekly basis. If you require extra cleaning or changes of bed linen and/or towels please contact reception. Towels are available in the Health Club should you avail of the facility. How many guests can the Lakeside Lodges accommodate? 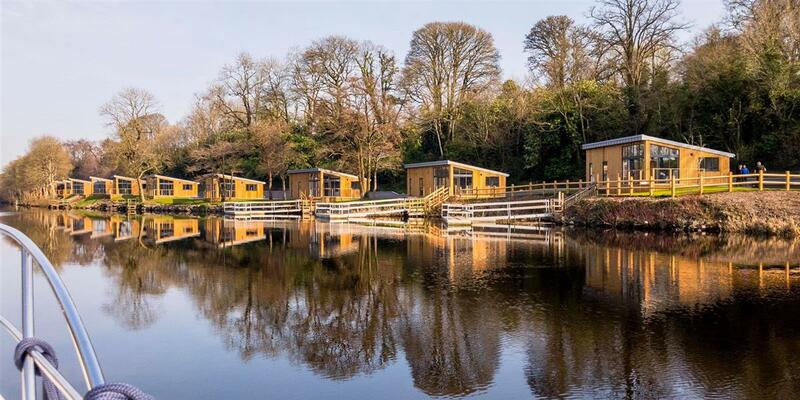 Each of our 14 Lakeside Lodges can accommodate up to 4 guests have two bedrooms and can be made into twin or doubles (with super kingsize bed) as needed. Yes, cots and high chairs are available, please request them at the time of booking. Is linen provided in the Lakeside Lodges? Lakeside Lodge facilities include a fully integrated washer/dryer for convenience. Dry cleaning services can be arranged upon request. Yes, there is a dedicated parking space outside your Lakeside Lodge. Yes private jetties available upon request. Yes. However, all Lodges have a private outdoor decking area. All Lodges are directly located on the banks of Lough Erne which can be enjoyed from your private furnished decking area. A number of Lodges feature a private Jetty. What entertainment facilities do the Lakeside Lodges have? Each Lodge has its own full HD Smart TV, which can be used to connect to your own personal Netflix and Amazon Prime accounts. Do the Lakeside Lodges have Wi-Fi? Yes. The Lodges have a strong Wi-Fi connection that is free of charge for guests. What cooking facilities are there in the Lakeside Lodges? The Lodges are equipped with fully modernised cooking utensils, cutlery and Belleek crockery. All Lodges have a microwave, fan assisted oven and four ring hob. If you would like to know more about the specific items available in the Lodges please contact the Reservations Team. Are pets allowed in the Lakeside Lodges? We currently accept well-behaved domestic dogs, however a charge of £75.00 will apply. Occupiers are asked to abide by the Terms and Conditions of our Dog Policy and respect the fact that not everyone enjoys a dog’s company. Dogs must be kept on leads at all times when on Killyhevlin Hotel grounds and it is the Occupier’s responsibility to clean up after their dog. The deposit maybe forfeited against damage done and/ or additional cleaning required.